Create a special event in somebody's life! Imagine the adventure of piloting an aircraft. An experience you will never forget! Or experience for yourself the thrill and adventure of flying a Ukiah Aviation Discovery Flight. A Discovery Flight is an introductory flight lesson, usually in a Cessna 150 aircraft, for only $119.00! You'll attend a short ground lesson, learn how airplanes fly, conduct a preflight, go flying and actually take the controls, all under the guidance of a Certified Flight Instructor. Schedule an aerial tour. 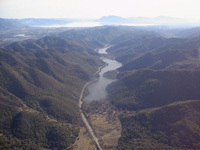 View Ukiah, Lake Mendocino, Lake Pillsbury, Willits, Clear Lake, and the Mendocino Coast from the air. Customize your Sightseeing Flight: $225.00 per hour for 1 to 3 passengers.